L-R: Storm Trooper (Galactic Empire), Mark Fennell (RPS), Max Wade (Chair of IWCG (RPS)), Paul Beckett (Phlorum), Storm Trooper (Galactic Empire). The Property Care Association (PCA) Invasive Weeds Control Group (IWCG) held their Annual General Meeting earlier this year. It followed the extremely successful launch of a new Code of Practice for the treatment of Japanese knotweed on domestic properties and within development sites. The PCA has also recently launched its training programme on The Control and Eradication of Japanese Knotweed. At the event, Philip Santo, leading RICS surveyor and former Chair of the RICS working group on Japanese knotweed and Residential Property, was awarded honorary membership of the PCA. In his acceptance speech he congratulated the progress made by the IWCG and acknowledged their help in producing the RICS Japanese knotweed guidance for surveyors (available for purchase on the RICS website). 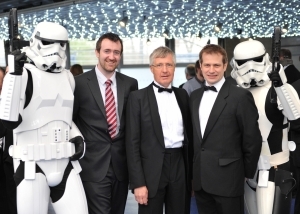 The AGM was held at the National Space Centre in Leicester, with security aptly provided by members of the Strom Trooper Corp of the Galactic Empire. The space theme was topped by guest speaker, Maggie Ebuoluwa Aderin-Pocock.